Centrally located in Kirkwood, Missouri, our mission is to provide our customers an outstanding value in plumbing services accomplished through experienced technicians, quality materials and fixtures. Did you know that J.E. 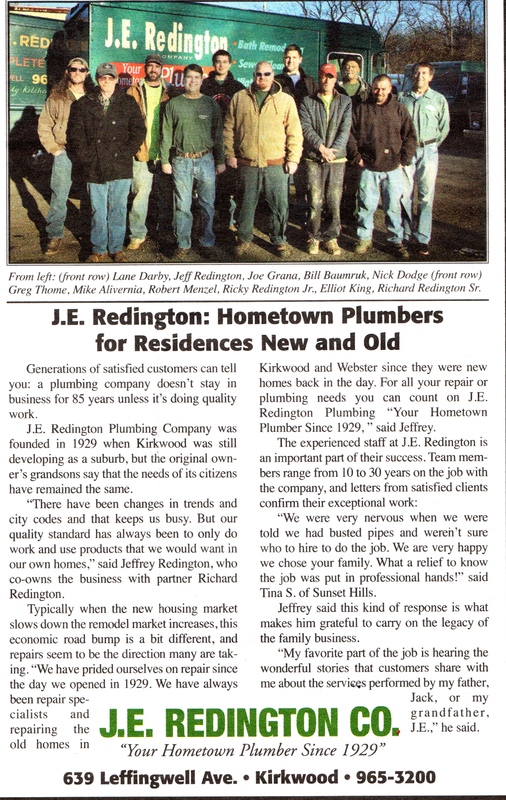 Redington company is one of Kohlers longest Authorized Service Providers in St. Louis? Not only do we sell Kohler plumbing products we are authorized for warranty work also. If we sell it we can stand behind it, and our long relationship with Kohler is proof of that. Check out our feature in the "Hometown Business Profile" issue of the Webster-Kirkwood Times! Receive $10 Off Your Next Service When You Mention You Saw This Offer on Our Website! We guarantee that you'll be satisfied with the work we do. Set up your service call today. We look forward to working with you.